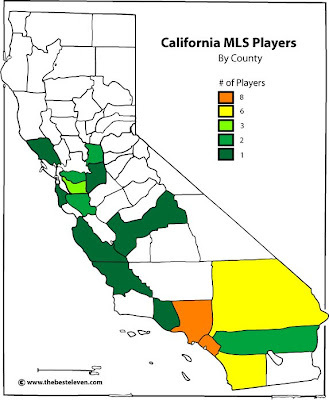 When I was doing the MLS Roster Maps I noticed that a large quantity of players in Major League Soccer are from California. The player numbers in MLS right now seem to be changing daily, but when I counted yesterday, the 46 players from California make up about 15% of MLS. This map was created using the listed hometowns for each player on MLSnet. It shows, by county, where the players are coming from, with Southern California being the obvious hotspot of soccer talent. It actually is even higher because you should look at California players as a percent of US players in MLS - it's probably much higher (~20%). Good point, I counted 205 US born MLS players. That means about 22% are from California out of the US player pool in MLS.